MIAMI (25 de enero de 2019) – Rombai continua su carrera de éxitos imponiendo nuevas tendencias con su inigualable ritmo y hoy nos presenta “Me Voy” (Remix) junto a Abraham Mateo y Reykon. “Me Voy” (Remix) ya se encuentra disponible en todas las plataformas digitales. ROMBAI cerró el 2018 con broche de oro y ahora de cara al 2019 continúan cosechando éxitos. Fer, Vale yMegu, le estan demostrando al mundo entero que verdaderamente son el trio perfecto. El cantautor uruguayoFer Vázquez, junto a Vale y Megu ya empezaron su gira por Latinoamérica. La gira arrancó exitosamente en la providencia de Catamarca, Argentina donde miles de fans se dieron cita para recibirlos con los brazos abiertos. Después llegarán a Coquimbo el 9 de febrero, Púcon el 13 de febrero y Viña Del Mar el 16 de febrero, además de presentaciones en Paraguay, Uruguay, Bolivia, Perú, Ecuador, Colombia y una extensa gira por toda la República Argentina. 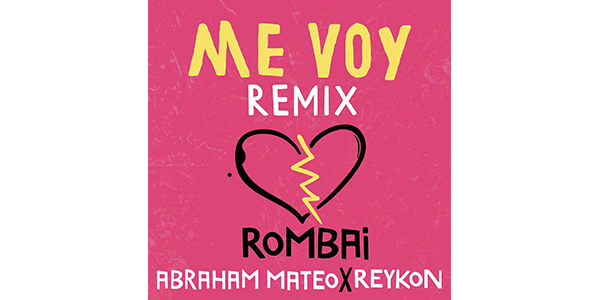 MIAMI (January 25, 2019) – Rombai is continuing on their streak of success, with its unparalleled “urban-cumbia” fusion, the Latin american band releases “Me Voy” (Remix) featuring Abraham Mateo and Reykon. “Me Voy” Remix is available on all digital platforms. The original version of “Me Voy” was a complete hit surpassing over 40 million views on YouTube, and more than 25 million streams on Spotify to date. The addition of “Me Voy” Remix featuring talented Spanish artist,Abraham Mateo, and one of the leaders of the urban movement in Colombia, Reykon will continue to rack up streams and leave fans wanting more. Rombai’s unique voices; Fer, Vale and Megu; meeting graceful guest vocals from Abraham Mateo and Reykon is taking “Me Voy” (Remix) to another level. The single was produced by Fer Vázquez, DalePlay and Laureano Pardo in Miami and is just a small preview of what’s to come from this “cumbia-urban” phenomenon. ROMBAI shined in 2018, and now it’s off to a busy start. Uruguayan singer-songwriter Fer Vázquez, along withVale and Megu, have kicked off their tour in Latin America. The tour started successfully in the providence of Catamarca, Argentina where thousands of fans gathered to welcome them. Next, they will arrive in Coquimbo on February 9, Púcon on February 13 and Viña Del Mar on February 16. Presentations in Paraguay, Uruguay, Bolivia, Peru, Ecuador, Colombia and an extensive tour throughout Argentina is to follow. ROMBAI was recently nominated for the 2019 edition of the “Heat Latin Music Awards” of HTV where they compete in the category “Best Southern Artist”. In addition, they were chosen as “10 Latin Artists to Watch in 2019” by Billboard, one of the most reputable sources in the music industry.